I've checked the prop direction, Calibrated the ESC's, even set the trim to the opposite direction. Nothing seems to help . 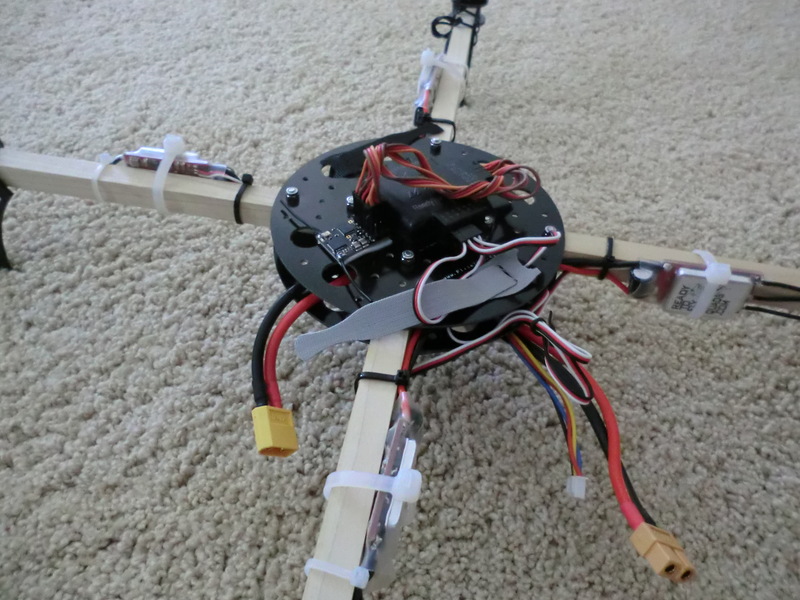 I'm using the Flite Test Electrohub build kit, using a standard X-configuration. I think its something wrong with the programming maybe but I'm unsure. I'm using a Multiwii Flip 1.5 control board. I realize that is a lot to look at, but I really am in need of help. 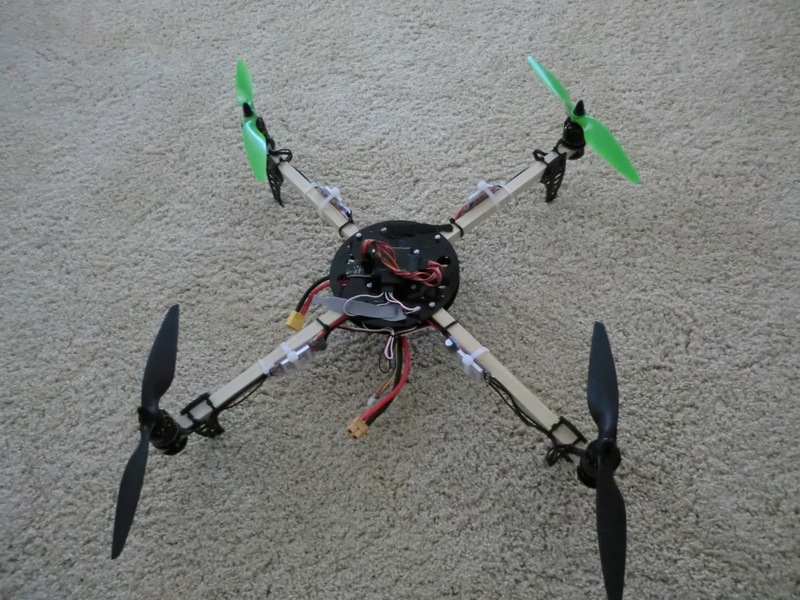 This quadcopter will not lift off unless I can correct this problem. hi, you say you checked the props.. do you mean you checked to make sure they are point the correct direction? the text on the prop faces up. the next thing that comes to my mind is double check to make sure you motors are spinning in the right direction. its all that comes to my mind at the moment. Motors plugged into the correct port on the Flip 1.5? I have checked prop direction, no problems there. Text on prop is facing up as well, but that's a good tip. Motors are also spinning in the correct directions, top left going clockwise, top right going counterclockwise, bottom left going counterclockwise, and bottom right going clockwise. So after checking my quadcopter's motor power in the Multiwiiconf GUI I'm noticing something really strange. The rear left and front right motors seem to continue increasing power after I stop moving the throttle. And on top of that, they're not increasing equally. Each increases at its own rate it seems. Any Idea what is going on? Despite seeing this I really have no idea why its doing it or how to fix it. I didn't see you mention calibrating the board. Make sure its perfectly level on a surface that won't vibrate and calibrate the board, otherwise it wont know which way is up. If you did that already, is there any chance you have the motor wires swapped at the control board or rotated? What about a possible short at the esc connection to the electrohub? If everything is hooked up correctly, it could be a bad esc (or miscalibrated esc)... even possibly a bad motor? Try running through the ESC calibration again. I'd also double and triple check the connections to make sure the motors are in the right places and the control board is connected to the receiver properly. What software are you using to set up the flight control board? If your motors are not starting at the same time, but still start up one at a time while at low throttle, and you've already run the ESC calibration sequences, you need to increase the MINTHROTTLE setting in the config.h file and upload. If you switch to the naze, you'll likely still have to adjust this, but you can do it from the CLI interface instead of opening the source code and rebuilding. FYI, changing this value in config.h does nothing on my MW Flip 1.5 with MW 2.3. In MultiWiiConf, in the upper left, if you click "Settings", you can change MINTHROTTLE on that screen, and it appears to work. Something else that is important and this probably should have been first (thanks again joshuabardwell in the above thread): Are you troubleshooting in ACRO mode? That way the board isn't trying to autolevel and spinning the motors at different speeds. That's honestly my best guess. Let us know! I'm back! okay so I tested each speed controller individually by attaching it to the receiver, eliminating the communication of the board. Each speed controller is in good shape, none of them continue to accelerate past what I told it to, so thats good. This leads me to believe its a problem in the programming of the multiwii flip 1.5, but I'm not entirely certain on how to fix that. I've tried uploading the default configuration for an X quad, only changing the minimum value for the speed controllers, knowing that the simonK firmware on the speed controllers are supposed to be lower. They still seem to accelerate. Is this a problem with configuration and programming or is it a problem with the control board itself? I have made sure each motor is plugged into the proper location, front left D3, front right D10, back left D11, back right D9. Is it flipping when I just starts to get lift, but is still on the ground, or is it flipping in midair as soon as you take off. With multiwii boards in my experience the quad may tilt a little while lifting off and you have to input against it at least until all feet are off the ground. Then it will be stable. So have you tried controlling against the flip until it is in the air? Are you flying in autolevel? If so it is normal to see that overtime the motors will continue to ramp up because they are trying to level the quad, even though unlevel ground is preventing them from doing that. Board orientation looks good, props look good, and motor plug location looks good as well. Glad to hear you got it flying! Taking off will be easier every time you do it. Another thing is that as you tune and get closer to the best PIDs for your quad you should feel it behaving nicer on take off. Now go out and fly and release your frustrations!